Heat oven to 475 F. Sprinkle flour on a clean smooth surface and stretch dough using your hand or rolling pin to flatten each ball to 1/2-inch thick circle. Transfer dough to spray-coated or cornmeal-dusted 12-inch pizza pans. Continue stretching to fit pans. Reserve 3 tablespoons of herbed olive oil in a small bowl. Blend in garlic and red pepper flakes. Brush oil onto crusts. Bake 5 to 6 minutes, just until crust begins to brown. Top each crust with 3 oz. sun dried tomatoes, 2 oz. radicchio, 2 oz. pancetta, 2 oz. Mozzarella. 1.5 oz. Fontina, and 1 oz. Gorganzola. Bake additional 5 to 7 minutes until cheese melts and begins to brown. Remove from oven; sprinkle with parsley. Serve immediately. 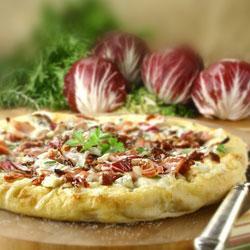 This entry was posted in cook, hot, radicchio, Salads for Adults, superfood by admin.royalrose. Bookmark the permalink.